Daytrips and Short-Term Excursions. Most vacations fall into a pattern of summer or year-end excursions preceded by long-term planning. However, for a short break to fit into a hectic work schedule or a more limited budget, short-term excursions nearby or as an add-on to a business trip can be a real tonic. Longing for a “spring break” but not able to get away, I charted my holiday around a weekend in my home town of Washington, DC. No longer still just a government-focused nation’s capital, the city has diversified. It is now a culturally rich destination with multiple options beyond just visiting the national monuments. 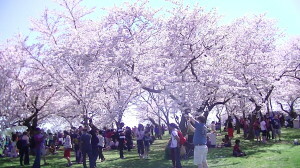 My break happened to coincide with one of the great spring draws: the National Cherry Blossom Festival. It first began in 1935 following a gift of 3,000 cherry trees from the city of Tokyo. It has grown to become a three week long celebration. The festivities end with a parade of highly decorated floats carrying Cherry Blossoms Princesses while lively high school bands lead the way. Although the weather can be a chilly 50 degrees and raining, for 2014 it was a glorious 75-80 degree day with no humidity, perfect for a walk the length of the parade route. In addition to an estimated crowd of 100,000 of spectators, 5 US Presidents were also in the parade or at least their stand-in’s were in sports jersey bearing their administration’s number. Washington, Jefferson and Lincoln were the most recognizable but were also joined by Teddy Roosevelt and Taft, the latter known for creating a permanent White House link with baseball. In keeping with the spirit of the celebration, some spectators joined in the fun wearing their own costumes, including in one case tee shirts combined with pink tutu’s. Underscoring the international character of present day Washington, street vendors offered a range of cuisine from Korean Kimchi to Punjabi fare. The global flavor was underscored by Chinese dances and the Japanese-American block-long street fair. I made my way walking the full length of the Mall parade route but without getting to the Tidal Basin, itself, the starting point for the Festival. 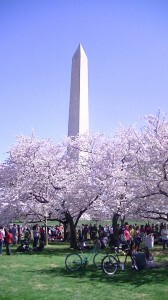 However, the Washington Monument grounds provide a competing array of the bright pink blossoms while multiple side streets in the commercial and residential districts have their own cherry blossom line-up. 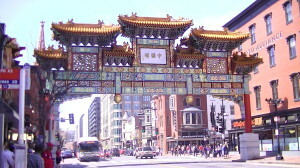 To continue my impromptu holiday, I stopped in at Washington’s Chinatown. Unfortunately, the neighborhood has been rapidly shrinking with the arrival of larger urban development. However, still remaining are several top restaurants featuring lunch specials as well as a few small shops with authentic local flavor, such as the New Da Hsin Trading Inc. It carries some of the same wares I saw in Beijing with prices competitive with the street vendors in China. There are tin cans of Chinese grocery items that I can only guess as to their contents and brightly colored screens with imperial dragons. I am always intrigued by the unique items they carry like umbrellas with UV protection (parasols?) and Chinese style “dresses” that fit over a wine bottle and make a great hostess gift. Rounding out the weekend’s contrasting holiday was a very different offering on Sunday in nearby Leesburg/Northern Virginia. The popular event was the annual horserace at the Oatlands Plantation, the spring Point-to-Point, a fundraiser for the Loudoun Hunt. Oatlands, the backdrop for the race, includes on its grounds a stunning mansion started in 1803 and open to the public as a National Historic Landmark. With such an action-packed weekend, I found that a short-term excursion, whether in our own backyards or abroad, can be a great filler between annual vacations. The price was right and no long term planning was needed!